In the summer of 2001 we got a recording from Alessandro Bosetti, saxophone player, improviser, composer of musique concrète and at that time having lived in Berlin for less than a year. The recording has pieces that he had just recorded with the guitarist Annette Krebs. The decision to release this recordings was made quickly, and in the summer of 2002 it should have appeared. Due to an unlucky chain of events, the recording is appearing only now, nine months later. But nothing has changed about its radical nature, its unconditional modernity. 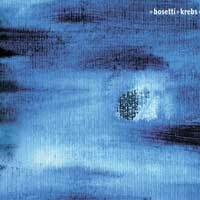 Krebs and Bosetti are among some of the most exciting musicians from Berlin, both have long been well-known in international circles. Annette Krebs, who plays an electro-acoustically prepared classical guitar, belongs on an equal basis with improvisers (and composers) such as Andrea Neumann, Taku Sugimoto, Toshimaru Nakemura or Axel Dörner, with whom she has worked with, she belongs in a category of those musicians who have expanded the concept of improvisation beyond Free Jazz, Post-Serialism or the "English School" in the last few years. Stillness, minimalism, noise (but the later is not meant in the sense of a racket, but as a kind of unmediated sound), rustling, consciousness of structure and spontaneity, all of these experience a new value through these musicians - above all through Annette Krebs' way of playing the guitar. The saxophone player Alessandro Bosetti has also devoted himself to a radical noise-like way of playing, and yet one always senses how strongly he has been influenced by Steve Lacy and modern jazz of the 60's and 70's. In their duets, they do not, however, simply extend their work on noise. The music is formed by a pronounced sense of structure. They work on short units, with many pauses and stillness - but never for the sake of a pause (or stillness). Each pause has it exactly defined place in the dynamics of the music. Bosetti and Krebs savor monochrome tonal colors, research the gray behind the gray - and nonetheless this music is not monumental, not simply noise, not a hermetic block. It is a very exact, reflected music that never becomes overbearing or stiff. It has something casual, in the best sense of the word, it's non-ambitious. Although one really senses the work involved in it and necessary for it, the music remains unstrained, completely nonchalant and cool. The artwork is from the musicians, made after a model from Franz Hautzinger.